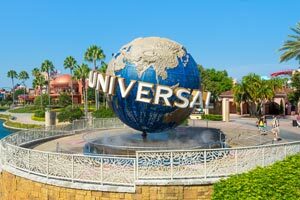 With a stay at Universal's Loews Royal Pacific Resort, you'll be centrally located in Orlando, within a 10-minute walk of Universal CityWalk™ and Hollywood Drive-In Golf. This 4-star resort is 1 mi (1.6 km) from Universal Studios Florida™ and 1 mi (1.6 km) from Universal’s Volcano Bay™. Make yourself at home in one of the 1000 air-conditioned rooms featuring refrigerators and flat-screen televisions. Cable programming and iPod docking stations are provided for your entertainment, while complimentary wireless Internet access keeps you connected. Partially open bathrooms with shower/tub combinations feature complimentary toiletries and hair dryers. Conveniences include phones, as well as safes and complimentary newspapers. Take advantage of recreational opportunities offered, including an outdoor pool, a sauna, and a fitness center. Additional amenities at this resort include complimentary wireless Internet access, concierge services, and an arcade/game room. Spending a day of fun is easy with the complimentary theme park shuttle. Enjoy Asian cuisine at Emerils Tchoup Chop, one of the resort's 3 restaurants, or stay in and take advantage of the 24-hour room service. Snacks are also available at the coffee shop/café. Relax with your favorite drink at the bar/lounge or the poolside bar. Cooked-to-order breakfasts are available for a fee. Featured amenities include a business center, express check-out, and complimentary newspapers in the lobby. Planning an event in Orlando? This resort has facilities measuring 85000 square feet (7897 square meters), including a conference center. Self parking (subject to charges) is available onsite. The preferred airport for Universal's Loews Royal Pacific Resort is Orlando, FL (MCO-Orlando Intl. ).